WCPE Episode 218 – Comparing Tanlines – WORST. COMIC. PODCAST. EVER! It’s time to say goodbye to summer 2018 (fingers crossed!) at the Worst. Comic. Podcast. EVER! Jerry survived a vacation drive to south Texas and back with his family. The kids (and John) are returning to schools. And Cullen is fighting to survive the bad air of Portland and the lack of air conditioning. While on vacation, Jerry made several stops at comic book stores along the way, and recounts the good, the bad, and the unexpected shops he visited. He did his part to support the local economies at each store visit, too. We have our weekly Pick 3 from Clint’s Comics, where we look at three books coming out next week that you should consider picking up. We kept things simple this week for you, with our #1, #2, and #3 picks sure to keep you entertained. Cullen shares news of an upcoming after-Con party the Friday night of Rose City Comic Con. 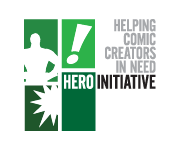 Live music, tacos, and you get to support the Hero Initiative. You need to be there, Portland Peeps! We discuss John Byrne’s visit to the Boston Comic Con, and the rumor that Marvel is trying to repair relations to bring back this legendary creator. We discuss what books we would love to see John Byrne take on at Marvel, but we would love to hear your thoughts too on this. Finally, we wrap things up going over some recent reads, including the new Fantastic Four #1 that came out last week. Despite the team not being together at all in the story, this was a good return of Marvel’s First Family. ‹ Marvel Saga Episode 13 – Evil Dared!